Pre-attached anchor clips are an important feature of STEELCO™ gutter screens. They provide easy and secure installation. When using standard installation technique, the clips should be pre-bent before installing the screens. Typically, aluminum gutters have a thin bead on the inside of the lip, 1/8" or less. Front edge of screen goes under the gutter lip as shown. By far, the most typical kind of rain gutter is aluminum. The preferred method of installation for aluminum gutters is to slip the back edge of the STEELCO screen underneath the shingles at the edge of the roof. Then, position the front edge of the screen under the lip of the gutter, as shown in the picture on the right. Once in place, the pre-attached anchor clip is used to secure the screen in place. No tools are needed. The anchor clips should be pre-bent before positioning the screen over the gutter. Proper installation will ensure years of effective rain gutter protection. Simple, safe, and secure! The anchor clips are simple to use and can be manipulated easily by hand, without the use of tools. While the purpose and use of the anchor clip is pretty straight forward, it is important that the installer pre-bend the clips BEFORE putting them in place over the gutters. Don't bend it completely flat. Leave room for the clip to fit over the inside bead on the gutter lip. Left, you can see how the clip is bent over the gutter lip to secure the screen in place. In this example, galvanized clips were used only for contrast. Choose the clip color that most closely matches your gutters. STEELCO™ currently offers white, brown, galvanized or copper clips. Painting the clips to match non-standard colors is very simple. Some gutters (vinyl) may have a taller lip than standard aluminum gutters. If the gutter lip is more than 1/8" high, you may want to fit the screen above the lip, rather than under, to prevent small debris from "damming" behind the lip. 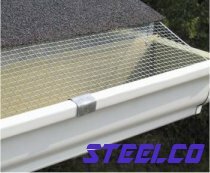 This alternative method for installing STEELCO screens is often used on half-round gutters. To see this alternative installation method, click here. One advantage of STEELCO screens is the many ways it can be installed. The type of roof, the pitch, age and other factors may dictate the need for an alternative installation method. The installer must use his/her best judgment as to the appropriate method of installation for the type of gutter and roof they are dealing with. Whenever possible, STEELCO screens should be installed with the back edge of the screen under the roofing material. This will help ensure the best performance in all conditions. IMPORTANT: Care should always be taken not to damage the roofing material, i.e., shingles, tile, shake, metal, etc. Don't hurry the job. For asphalt shingled roofs (especially old ones), it is best to wait for a warm day and allow the sun to warm the shingles. This way, the aged shingles may be a little easier to work with. If asphalt shingles have a downward bend at the overhang, just lift gently and slowly using a wide, flat tool, like a paint scraper. Once the STEELCO screens are in place, the shingles will eventually settle and flatten themselves out. Don't force it.